Be the first to share your favorite memory, photo or story of Libby. This memorial page is dedicated for family, friends and future generations to celebrate the life of their loved one. Libby B. Starns was born May 14, 1938 in Normangee, Texas. She was the only child of John & Lera (Donahue) Batson. Following high school graduation, Libby attended Cosmetology School and worked most of her life as a beautician. She loved painting landscape scenes and going to flea markets. In her younger years, Libby also liked to travel. Libby especially loved people and visiting with them when any opportunity arose. She was Assembly of God in faith and was a very religious person. Libby had lived most of her life in Madison County. 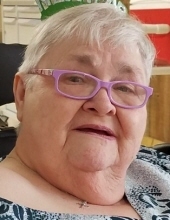 She passed away January 15, 2019 in Bryan, Texas and is preceded in death by both of her parents; husband, Graydon “Fuzzy” Starns and son, Graydon Shane Starns. Libby is survived by her step-daughter, Linda Allen of New Braunfels, Texas. A graveside service celebrating Libby’s life will be held 11 A.M., Friday, January 18, 2019 at the Midway Cemetery in Midway, Texas. Rev. Johnny Valdez will officiate the service. A brief visitation will take place Friday morning from 9 A.M. to 10:30 A.M. at Madisonville Funeral Home in Madisonville. To send flowers or a remembrance gift to the family of Libby B Starns, please visit our Tribute Store. "Email Address" would like to share the life celebration of Libby B Starns. Click on the "link" to go to share a favorite memory or leave a condolence message for the family.